Our 10 foot black Slim HD15 video cable, more commonly referred to as a SVGA male to male cable, is typically used to connect a computer to a computer monitor. This specific cable is a slim version, composed of 32 AWG (American Wire Gauge) coaxial wires, which is easier to route and manage. Ferrite Cores are small magnetic cores wrapped around the ends of the cable. They are used to suppress EMI/RFI electronic noise on the cable by absorbing the unwanted high frequencies and dissipating them. Slim SVGA Monitor Cables are smaller diameter than normal SVGA cables. Slim SVGA Cables also have a smaller hood and ferrite's to fit where other SVGA Cables will not. 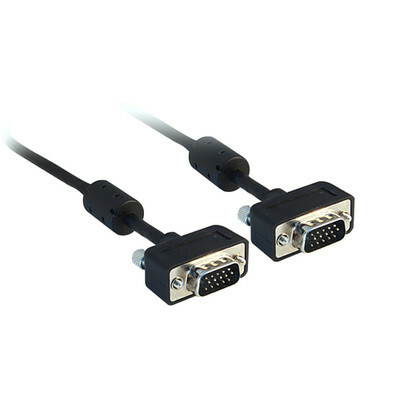 Our SVGA video cables can handle the lowest resolutions used on computer monitors today all the way up to a maximum of 2048 x 1536. Cables worked perfectly and great prices! The product was exactly as described and pictured.